I’m a member of Black Women Losing Weight and some of you who are also members will agree with me that, people share their success stories on the site’s blog. One of which caught my attention, very real and I’m truly inspired by it…Enjoy. I lost 120 pounds and it took me 18 months. I have been healthy and maintaining my weight loss for 8 years now. I exercised daily with weight resistance training, lots of running and jumping roping. I changed what I ate and how much and how often. I learned everything I could about living a healthy lifestyle and I implemented what I learned to see how my body responded. I got positive results and kept doing things like going heavier on my weights and adding more protein to my diet. 8 years ago, I was a different girl. After years of being a wife, stay-at-home Mom and battling clinical depression, I weighed over 230 pounds. Remotely, I went to see a psychiatrist every 3 months to restock my prescribed supply of Prozac. I did that for 8 years straight. I slept most of each day away, because it was the closest thing to death. Oddly, I remember very little about that period of my life. I wore a version of the same outfit most every day- a “Just My Size” t-shirt in a size 3X and black elastic waist pants in a size 2X. I couldn’t feel. My heart was shrouded in darkness and despair most days. I wasn’t living, I merely existed. I ate crap and did not exercise my body. I’d lost sight of my goals and my dreams. The rude, hurtful comments people would make about me being so fat, would play over and over again in my head every day. My identity was that of an invisible woman. I had lost… ME. 8 years later, God woke me from that season of obesity, depression and despair. God said, ” It’s time for you to walk into your destiny” and I began a journey of a thousand lives to overcome obesity and reclaim my life. What did it take?? Precisely what I teach my clients and the world today: IT TOOK CHANGING EVERYTHING. I had to put myself first. I had to learn how, what and when to eat. I had to learn how to exercise and lift weights. I had to remove toxic people and relationships from my life. I had to change my mind and make the decision to go forward. No matter how many setbacks, no matter how much weight I had to lose and no matter how many people said I couldn’t do it, I did it. I grew spiritually and in so many different ways into the person you see pictured in the “after” photo. As a Biology/Pre-Med major in college (Hampton University-big ups), I always knew that I wanted to heal people but I knew I didn’t really want to become a Doctor. I graduated with that Biology degree but God had an alternative plan for me that wouldn’t be revealed until many, many years later. 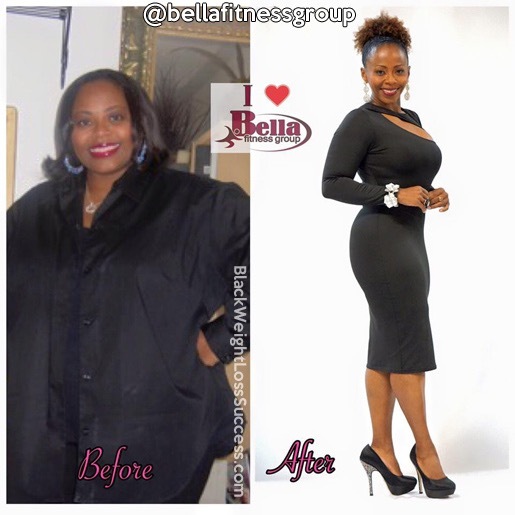 Bella Fitness Group was born out of my struggle. That ugly cocoon of depression and obesity birthed a beautiful spirited butterfly whose purpose is to ignite and heal the hearts, souls and bodies of people struggling with obesity. To God be the Glory. If my Dad had lived to see what I’m accomplishing and building now, I think he would be so proud of me. After all, like me, he was a Visionary dreamer, Educator, Entrepreneur and somewhat of a Renaissance Man. I never got to share all my plans, dreams and the Visions God has given me because he died 3 years ago. Daddy, continue to shine on me and continue to be that silent wind beneath my wings! I hope I’ve made you proud, even though I didn’t become the M. D. you always wanted me to be. In 2009, my story was featured in a number of publications beginning with the Atlanta Journal Constitution newspaper. People from all over the world began reaching out to me to help them get healthy but I wasn’t Certified as a trainer. My gut said to get certified and help create a healthier world and give the gift of New Life that I had been given. So, I created a company called, The Bella Fitness Group, which means “beautifully fit”. I started with 5 clients at boot camp, did Personal Training in homes for a few years and finally opened my first Boutique Fitness Studio in 2012 with meager beginnings. Today, although the company has grown, I am still not nearly where I want to be because the VISION God has given me is so great. There is so much work left for me to do. As an entrepreneur doing everything on my own with no safety net, no “real job”, and being a Single Mom of 3 amazing kids, this path is not an easy one. There are days when I wonder how I will keep the lights on at the studio. Days when I wonder if anyone will show up. Days when I wonder if my message of optimal health is really getting through to my clients. But, STILL I RISE and meet the challenge every day, albeit sometimes in tears and desperation, but I know my faith is simply being tested and I thank God for deeming me worthy enough for HIS tests. I share my journey periodically as a reminder to all of the people like me. I hope that my story can speak to people who are still in the struggle fighting depression, obesity and living less than what they know their destiny calls them to be. There’s hope for you too. There’s another life waiting for you. There will come a moment in time when you’ll wake up. Your heart will beat faster again and you’ll dream again. You’ll live again! There’s a blessing and a testimony mounting, but you just have to BELIEVE and never cease in your praying and faith. Once you literally get sick and tired of being sick, fat and tired, you WILL FIGHT. There’s a beautiful butterfly in each of us. Let her fly! Come on, you got this. So, to everyone reading this post, I ask that you share this with someone you know who needs to hear my story. Tell them they have a choice. 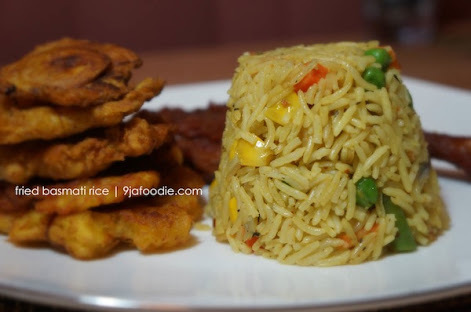 This is a tested and recommended basmati fried rice recipe from 9jafoodie. Try it out and let us know how it goes. Add in 3 cups water. Cover the pot, increase heat to high and bring the mixture to a boil. Place another large pot on medium heat, add in the left over oil and heat slightly.Add all left over ingredients and cook for 2 minutes.